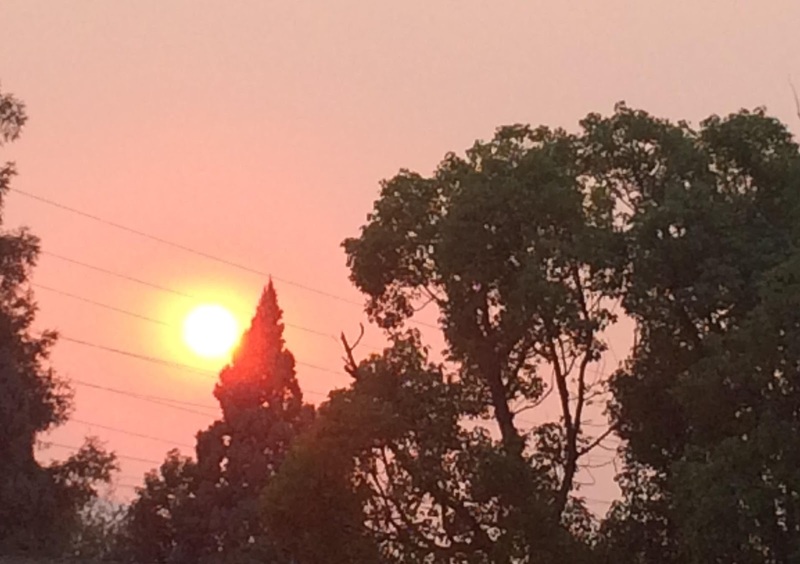 In Northern California, when the fires tear across the land, the sun sometimes turns pink, even hours before sunset. It gives you this sorrowful feeling that colossal suffering is happening not so far away. It reminds me of when I lived in the Midwest - when the the eerie yellow-green light would fall onto the streets just before a tornado would touch down. Pink sunlight in the middle of the day is surreal - and you always view it with smoke-filled lungs. When I heard that the fire nearby was the worst one since 1933, I couldn't help but think of the turnings of time, the patterns of generations, and how much of what we have experienced through history as Gen X, is connected to the Lost Generation - like earlier this year when the unbelievable flu season we endured was compared to that of 1918. When you are traveling in open spaces in California and you look out at the fields under the power lines where the green vegetables quietly grow, it's like you can still feel the sorrow and exhaustion of the migrant workers who came to California during the Great Depression. Many of us are rolling up our sleeves organizing help in small local ways, because that's what Gen X does, and we are bringing our resources together. People across the state are offering whatever resources they have - land for displaced horses to graze, free housing, they are using airport space to reunite people with lost pets, good people in food trucks are giving out free tamales. Goodwill is handing out clothes, blankets and other necessities. Sometimes what people need most is a toothbrush. Sometimes what they need most is a hug. There are countless ways to help people in both parts of CA, whatever nonprofit you trust, if you want to donate, they are most likely helping out. In the midst of all the great suffering and tremendous loss that has gone on under this sun, there are heroes emerging every moment - paramedics, fire fighters, people who are reuniting lost loved ones with each other and lost animals to their families, and girl scouts stacking canned soup into boxes that will be driven north. Sometimes we don't even realize the resources we have, and in a flash of genius we are able to offer something no one else can. Sometimes we pray and we don't even realize we are praying. Sometimes we give because we remember a time in our lives when our suffering was similar to the people we see suffering at this moment. In this moment, there may be a way for you to give in a way that no one else can.